Houses that are passively warm in winter and cool in summer, are said to be thermally efficient - this also helps make them energy efficient because of the low heating and cooling costs. At All Australian Architecture we design thermally efficient homes - well beyond the 4.5 - 5 star ratings required by BASIX..
For each new home or renovation design we can provide an assessment diagram that gives a room by room breakdown of efficiency and heating / cooling requirements. For more information review our thermal comfort assessment guide & sample thermal assessment diagram. Our first 8 star home, hence the name. Construction was completed in 2013, from a mixture of cement rendered masonry & lightweight Scyon cladding and Colorbond roofing. This home achieves great performance because of its orientation, eaves shading, cross ventilation & insulation levels. This minimalist home was completed in June 2011. Constructed of insulated full brick with concrete roof and floor slabs, its high thermal mass & use of clerestory windows helps it achieve the high 8 star thermal rating. This contemporary home design uses a foam impregnated concrete block system called 'Benex block' which provides an insulated single skin solution. The design also makes use of clerestory windows and encourages a stack effect which draws cool air from across the swimming pool. 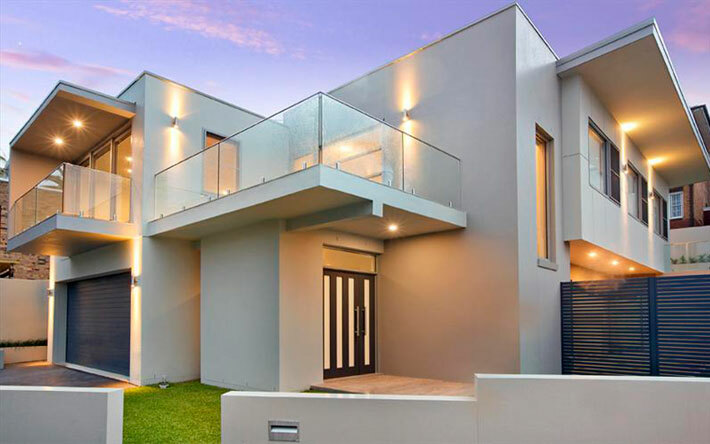 Designed as a project home for Dockland Building Services, this home is designed to achieve high thermal ratings at any orientation. A cost effective single level home in 4 different facade styles.